Sailu, what a novel way of making mango smoothie! I can’t wait to try this!! Yummy! 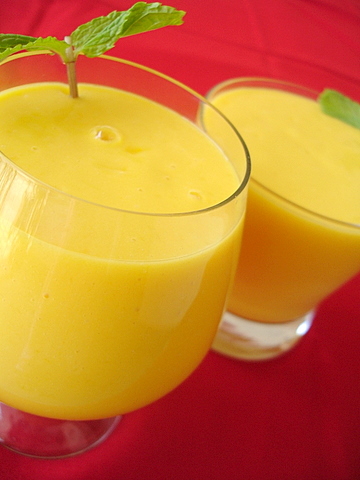 I never would have thought of putting coconut milk in the mango smoothie! Great idea! Where to get coconut milk in North India? Can we make coconut milk at home? Tetra pack coconut milk is available in most departmental stores. Yes, you can make coconut milk at home. Grate fresh coconut, for 1 cup of grated coconut, add 1/2 cup of warm water and leave aside for 10 mts. Blend to paste, strain the water, discard pulp. Your coconut milk is ready. For the smoothie can we use mango pulp instead of fresh mangoes. Here is United States the mangoes don’t taste that good. And we get mango pulp throughout the year. sailu thanku so much for your recipies .. could u refer any good n healthy recipies for pregnant ladies…. would be more thankful…. Hi, I put some lime in here too and 3 Teaspoons of sugar – it was too sweet, so I tried to counteract with two tubs of natural yoghurt and 2 bananas – its still very sweet – I might make it into sorbet? Sorbet is a great idea.